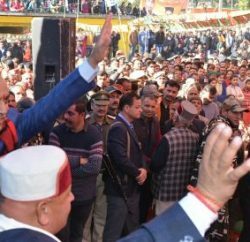 Shimla: The Himachal Pradesh Cabinet has accorded its approval, in principle, to provide 10 percent reservation to the economically weaker sections of the general category in the services of the State in Class-I, II, III and IV posts. Ahead of the parliamentary election, the Union Government has mooted to give reservation benefits to economically weaker section in general category and amidst the criticism form the opposition government passed the Bill in the Parliament and paved way to give 10 percent reservation in jobs and educational institutions to the economically weak general category families. The BJP ruled Gujarat was first state to implement the reservation and now Himachal Pradesh has joined the rank. 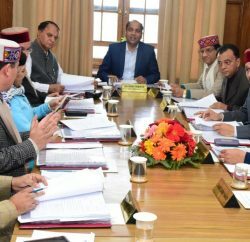 In another decision, the Jai Ram Thakur Cabinet decided to constitute the State Compensatory Afforestation Fund Management Authority and creation of Special Fund to be known as State Compensatory Afforestation Fund for compensatory afforestation on degraded forest land/non forest land and Net Present Value (NPV) of the diverted forest land. 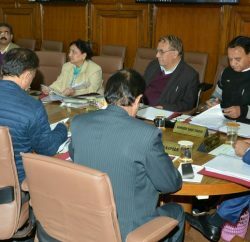 The Authority will consist of a governing body to be chaired by the Chief Minister and Steering Committee to be headed by the Chief Secretary and Executive Committee to be chaired by Principal Chief Conservator of Forests as Chairperson ex-officio. The Cabinet put its seal to give guarantee for Rs. 10 crore in favour of Himachal Pradesh State Forest Development Corporation Ltd. to avail Cash Credit Limit at lower rates of interest subject to charge of monthly guarantee fee of 0.5 percent from the Corporation. It also decided to implement District Good Governance Index (DGGI) in all the districts of the State to ensure good governance and evaluate governance trends in every district so that the governance gap if any could be bridged. The State Cabinet also decided to implement compensation scheme for women victims/survivors of sexual assault/other crimes-2018 to provide compensation to the women who had suffered loss, injury, as may be, as a result of the offence committed and thus required rehabilitation. Under this scheme, amount of compensation would be provided to the victims under Women Victims Compensation Fund as decided by the State Legal Services Authority or District legal Authority. The compensation to the affected women to be provided ranges between Rs. 2 lakh to Rs. 10 lakh keeping the gravity of crime. It gave its nod to extend the validity period of Letter of Intent (LOI) and licenses BWH-2 and D-2A for setting up of a distillery at village Bhangla, Tehsil Nalagarh, district Solan in favour of M/s Kala Amb Distillery and Brewery Pvt. Ltd.